The books of the Hebrew Bible were created by anonymous writers during the first millennium before the Common Era (BCE). Their messages and concerns are the central theme of the book. The writings that make up the Hebrew Bible are expressions of their great creativity, their interpretation of life in their own time and their perception of its meaning. It is easy for readers to get lost in the minutiae of biblical criticism, which has concerned itself for so long with historical reconstruction. This book will encourage them to listen carefully to what the biblical writers are saying to allow the message of the Hebrew Bible to emerge once again. In a sense, too, the intrinsic value of the Hebrew Bible is now re-emerging, after centuries of Christian interpretation, and its importance - as a literature from which three major religions, Judaism, Christianity, and Islam have developed - is beginning to be understood. This book is not another history of Israel, nor an introduction to the books of the Hebrew Bible. It is an exploration, an invitation to the reader to set off on an expedition of discovery. 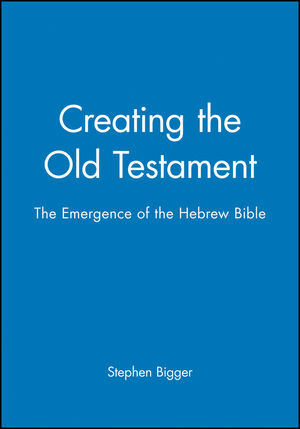 It may perplex readers that scholars disagree, often fundamentally, on virtually every issue: Creating the Old Testament raises and discusses issues, so that the reader can observe how hypotheses are formed and how the apparently 'assured results' of scholarship are constantly tested. In following this path, readers are encouraged to develop their skill in evaluating historical data, recognizing textual problems, interpreting symbolic language and understanding the deep concerns of biblical writers. They will investigate different and varied exegetical traditions. They will be stirred to reflect on what the biblical books have to say for life today, whether viewed from a Jewish, Christian, Muslim or secular perspective. Dr Stephen Bigger was the Principal Lecturer in Religious Education, Westminster College, Oxford.